His career history reflects extensive leadership experience in higher education. At UWC he moved through the ranks from being an Academic Assistant, to being appointed as Lecturer, Senior Lecturer, Associate Professor, Professor, Head of Department, Senior Professor and Dean of the Faculty of Community and Health Sciences. In 2001 he was appointed as Deputy Vice-Chancellor: Academic, a position which he held until 2005. Following his career at UWC, Prof Pretorius was appointed as President and Pro Vice-Chancellor of Monash South Africa, the local campus of Monash University, Australia. In 2013 the University of Pretoria appointed him as Vice-Principal (Academic), responsible for Teaching and Learning as well as planning and resource allocation. Prof Pretorius is a Psychologist by training who earned his BA, BA (Honours) and Master of Arts (Psychology) degrees from UWC. He has published extensively in respected national and international journals in the fields of career psychology, coping, stress, statistics and research methodology. In addition, he has served as a journal editor, and authored and co-authored a number of books, monographs and chapters in books. He has been honoured by the Psychology Society of South Africa for his contribution to the discipline. He also participated in the Yale Southern Africa Fellowship programme (Yale University) and completed a Strategic Leadership Programme at Oxford University. He also holds two Doctoral degrees, a DPhil from UWC and a PhD from the University of the Free State. Tyrone Pretorius was born in Sterkspruit in the former Transkei and grew up in King Williams Town. He is an Emeritus Professor at Monash University in Australia. 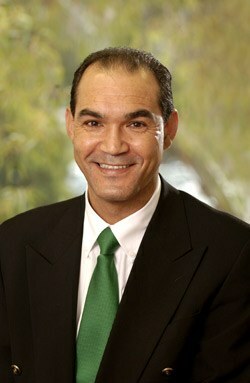 He is also President of University Sport South Africa and Chairman of the Board of University Sports Company. Professor Pretorius has two daughters and in his spare time enjoys reading, watching sport and listening to music. He returns to UWC with a career in higher education that spans 33 years, of which almost 26 has been spent in a range of senior leadership positions. His deep understanding of UWC, its history, achievements and challenges is supported by his broad experience at other institutions, which prepared him for his return to his alma mater as its Rector and Vice-Chancellor.